At the ripe young age of 25-years-old, Adam Page is one of those talents that currently stands on the precipice of greatness. Bullet Club’s resident ‘Hangman’ has put all of the necessary ingredients together in recent years to put himself in a really pivotal position in his career. After spending some time pulling double duty as a Ring of Honor regular and a high school teacher in a small town of less than 200 people in Virginia, Page is now wrestling full-time. This is due to his services being needed in Japan as a member of pro wrestling’s most popular faction. So it goes without saying that the Hangman’s life has changed since becoming a member of Bullet Club. 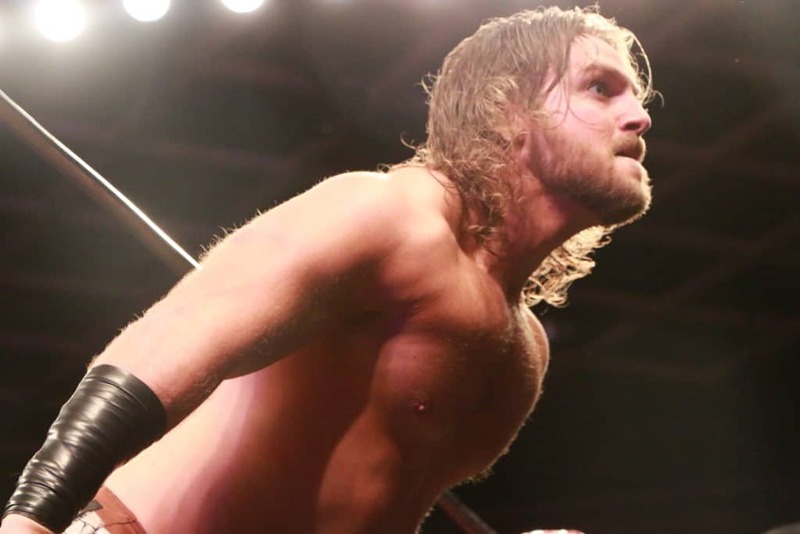 As the partnership between Ring of Honor and New Japan continues to strengthen, Page has been traveling back and forth over the past nine months working shows for both promotions. When it comes to Page’s ‘Hangman’ persona in the ring, some fans haven’t been shy about connecting with him about losing loved ones to suicide. Those concerns have not been ignored by Page. “You know, being a dude who walks around on TV carrying a noose is something that I realized I make my living off of. I had a couple of fans of fans reach out to me, not asking for anything or anything like that, but kind of sharing their experiences of losses in their lives from suicide,” Page said. Page took it upon himself to put some of his Bullet Club ring gear up for auction recently. 100% of the proceeds were donated to the American Foundation for Suicide Prevention (AFSP). As far as Bullet Club is concerned, fans that have been following the group closely are fully aware that there has been some dissension in the ranks. Earlier this month, Adam Cole attempted to fire The Young Bucks, to which the Bucks responded by saying that Kenny Omega, not Cole, was their leader. With almost a full year under his belt with the globally recognized stable, ‘Hangman’ is fully aware of these issues. “It’s a problem right now because I don’t know that us in the Bullet Club really know that we feel one person is the leader versus the other. I don’t know if the fans feel that way either,” the ‘Hangman’ explains. “Kenny has led the group in Japan but Cole has led the group here in American, so I think we’ll have to figure that out here soon,” Page added. This Saturday night at Supercard of Honor XI, Page will team up with his Bullet Club mates Tama Tonga and Tanga Roa, The Guerrillas of Destiny, to take on the current ROH 6-man tag team champions, Bully Ray and The Briscoes. While going to war with The Briscoes may be nothing new, Page did not shy away from sharing his thoughts on ROH newcomer Bully Ray. “They’re the 6-man tag team champions, newly crowned in Ring of Honor. With The Briscoes I know what to expect; I’m gonna beat the hell out of them, they’re gonna beat the hell of me. It’ll be vicious, it’ll be brutal, as it always is. I think I have the best chemistry with them as far as anyone else in Ring of Honor,” Page said. Supercard of Honor XI goes down this Saturday night at 6:30 p.m. ET live and will be available for purchase at both ROHWrestling.com and FITE TV. Make sure to follow ‘Hangman’ Page on Twitter @theAdamPage and check out his website – AdamPageWrestling.com – to pick up his newest gear (the Bullet Club ‘Hangman’ tee is sick!) and keep a close eye on his schedule to see when he’s coming to your town.